So, about two months ago, the praised stream Get Good ended. The community was torn by this abrupt ending of GG, as they enjoyed it. A friend and I made Get GR8 as sort of a spiritual successor. As first time streamers we really didn't know what to expect, so we tried some things that didn't work. You'll see a few examples of this if you look at our Youtube channel and our Twitch channel. We tried an EU stream; that didn't work out at first, although we were able to get it working again. We tried having multiple commentators; they all left us. So that leaves me and TheCrankMachine and sometimes Joshb. Anyways, signups are posted usually on the Sunday or Monday of the event and they end on Friday at 5 PM. TCM and I (just call me N; I know my username is freaking weird) will join the steam chat for our group (linked below) and we expect you to be there on time for your signed up matches. An annoucement will go off at 4 PM for each stream, so if you completely forget about it, a short little steam notification will appear if you're a member of our group. There are some rules and guidelines, as well as FAQs and tips in our Steam group's discussion board. You'll play 3 games with your opponent, we commentate, you leave, you watch, you learn. Isn't it magic? The stream is every Saturday at 4 PM EST. Open lobby starts after the stream and lasts for about 20-30 minutes (or shorter or longer, depending on the time we have left). Thanks for creating a thread here! I think you probably should just post the new signup form as a reply to this each week, I BELIEVE that's how skullbats and funkyhellboy weeklies handled it. It also makes it easier since players can just watch the thread, and they get an email notification everytime something is posted here. ...but really though, sounds good. 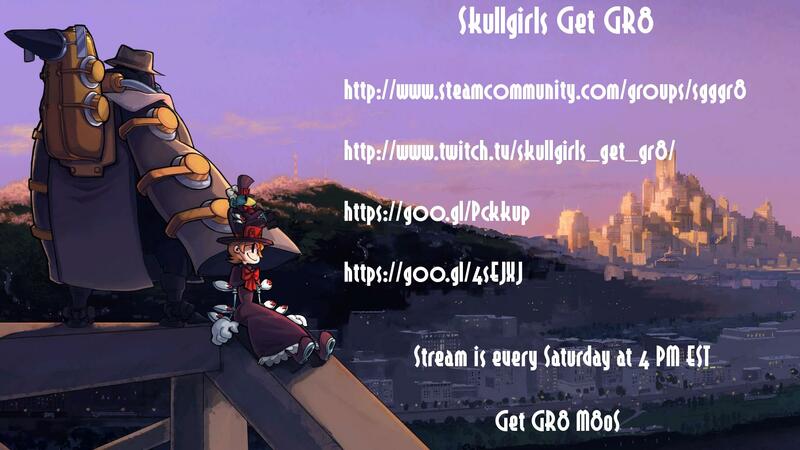 Posting here is a good idea, but just remember that Get Good was very much a /r/Skullgirls thing. I don't remember there being much crossover from Skullheart. You're right, but we were told to post here. So far I think it's a good idea, considering that a lot of people miss the signups on /r/skullgirls and our steam group... somehow. Alright, well... we're sorry that you found an issue with our application; however the identification of gender is necessary to use proper pronouns. If you don't want to fill out the Twitch section, just say "N/A" in the box. As for gender, it is entirely confidential; nobody but I and the other members will see it. thats ok don't say sorry! I'll just go with something random then. We're glad to have you. Let's hope that you're still as good I remember! See you Saturday. TheCrankMachine and Sinclair like this. Oh, where are my manners? Signups are live! all the waifus belong to me. That's awesome! We're glad that you had fun! Be sure to come back this week! Get GR8 (NA) for February 13th, 2016 has been cancelled. Signups for Feb. 20th 2016 are live. See you Saturday, and also expect an announcement tomorrow from the Get GR8 staff. Signups for Feb. 27th 2016 are live! See /r/skullgirls or the steam group announcements for a detailed update post. UPDATE February 22nd, 2016 - I have just been informed that there is no EU stream this week. We apologize in advance for any confusion this may have caused. The NA/EU signups for the week of 3/5/2016 are here, and the links are at the bottom! We had a great turnout last Saturday, and everyone enjoyed the stream! Quick note that we will be sticking to a full-sized open lobby for the After-show. Anyone who'd like to join in, can! Hope to see you all this Saturday! Hello. Someone just told me about this group, and I got excited when I heard what you all are about. I went ahead and signed up, and have asked to join the steam group. I don't have the Discord program yet (I just found out what it was). Could someone tell what all I would need to do to be ready for tomorrow if I was able to get in? Welcome! Glad you decided to join us! All you have to do is be in the steam group chat at 4 PM ET (just click "Enter Chat Room"), and tune in to twitch here. Based on your information, you will probably be one of the first matches, so try to be on time! Play a couple of matches to warm up before the stream starts. If you are showing any signs of lag, turn off the stream just for the matches, it will help you play at your best. We will be commenting on what you can improve in your play, so in this case be sure to watch your matches in the VOD after the stream! Be aware of who your opponent will be! We will post match-ups early tomorrow. I'll make sure to get Discord, and subscribe to the twitch channel this evening to be completely prepared. I have no problem with being ready right at 4EST. I will most likely be too early. And I'll probably spend all evening and night getting ready. How important is the reddit part of this group? Signups, Match-ups, and cancellations will be posted EVERYWHERE. The Steam group, the Reddit, and this Skullheart thread. Basically, anything that you NEED to know to participate will be available here. However, every Monday when we post signups, we make a new post on the subreddit, and if there are any minor changes, announcements, etc. those will be there. The NA/EU signups for the week of 3/12/2016 are here, and the links are at the bottom! For everyone who participated, be sure to check out the VODs of your matches if you didn't catch all the tips! NA and EU have been merged into a single stream. The attendance is simply to low. We had zero participants from EU this week. If the participation regularly picks up again, we'll see what we can do. This mean, EU stream is at the same time as everyone else's stream: 9 PM GMT! We will edit the overlays to reflect this change as soon as possible. Any announcements we make will be posted everywhere from now on (i.e. Reddit, Skullheart forums, and Steam Group as well). We were already basically doing this, but I wanted it to be clear since the question came up recently; you can follow any of these three and get the same news. New posts every Monday and Sunday. I just wanted to say that to me, this stream is the most fun I've had in a long time. But due to college and other time constraints, along with my friends moving on from Skullgirls, I will no longer be apart of Skullgirls Get GR8. Let me start with saying that 430 hours in Skullgirls trumps any other game that I have in my library, which is shocking to me. I started from square one, just like everyone at one point or another, and at first the game was really weird to me. I laughed at the character designs, I laughed at some of the moves… but I mean, it was fun. I played with my brother, who is my best friend, and we essentially had an “arms race” to see who could be better than the other. Every day for weeks on end, we'd play at least three games or more. Some days, he would win; some days, I would win… We were pretty evenly matched. At around 300 hours in the game, my brother shortly retired from Skullgirls. This hit me pretty hard. Imagine losing the best sparring buddy you could have ever asked for; he plays the game with you every single day, he tells you what you did wrong, he never gets salty… truly, doing the stream after he left was kind of hard. This community thrives on these people who want to play the game with their friends and get better than the other, and having just lost the best SG sparring buddy I could have asked for... it wasn't the same understandably. I mean, I had to think to myself, “Am I really having fun anymore? Is this stream thing enjoyable to me, not just these players?” I had to factor in a few other things; college, high school, etc. and after thinking about it, I came up with an answer. I have decided that I'm going to retire from Skullgirls and that I'm going to resign from the Skullgirls Get GR8 team. I really had fun with you guys. I had fun watching you guys grow and have fun, but I think it's time for me to move on and to a.) take a break from streaming for a while and focus on school and b.) learn a new fighting game. I'll still be around, just not contributing as much as I used to. TheCrankMachine will be taking my place and will be managing everything from here on out. This has been one of the best times of my life. I hope you guys enjoyed me as much as I enjoyed you. It is very sad to see N leave, he has done so much for us and the rest of the community. However, this is not the end of Get Gr8! So Get Gr8 start at 9GMT tomorrow, correct? If so, I believe that's translates to 1pm PST and 4 PM EST. Are these times correct? Yep that's exactly it. Good luck to all tomorrow! Bit of a small turnout this week, try to encourage other players to join! Don't feel like you're too bad [or too good ;) ] to sign up for next week! If you want to improve, we will give whatever advice we can! The NA/EU signups for the week of 3/19/2016 are here, and the links are at the bottom! We had a great stream with a very active chat! We had a bit of a small turnout this time around since many regulars were busy this weekend. I hope everyone can make it next week! Try to encourage other players to join! Don't feel like you're too bad [or too good ;) ] to sign up for next week! If you want to improve, we will give whatever advice we can! An AMAZING turnout this week! I am so excited to have everyone here, new faces and old! The NA/EU signups for the week of 3/26/2016 are here, and the links are at the bottom! Huge turnout last stream, and I hope every future stream is just as amazing! WOW! We keep on growing!!! This is fantastic, and I know it's gonna be a great event! The NA/EU signups for the week of 4/2/2016 are here, and the links are at the bottom! Last stream was a blast, with a record of 19 registrants!!! We can't thank you guys enough for helping the stream grow! I am so glad all of you wonderful players could make it this week, let's have a fantastic event!